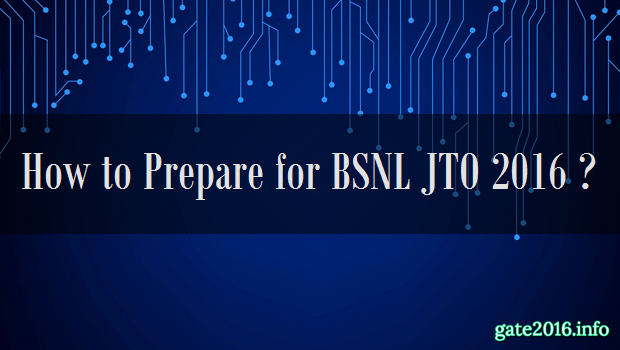 Olxam » BSNL JTO » How to Prepare for BSNL JTO 2016 ? “How should I start preparation for BSNL JTO 2016 ? 1. Follow latest BSNL JTO syllabus carefully. Candidate must have a printed copy of BSNL JTO syllabus. 2. Select good reference books / study material. Selection of good study material will help you well in your BSNL JTO exam preparation. 3. Prepare all three sections of BSNL JTO syllabus equally. Many candidates fail to clear General Ability section. This was the main reason of failing of many candidates in BSN JTO exam in previous years. 4. First complete BSNL JTO whole syllabus as soon as possible. You are going to attend BSNL JTO 2016. So, You have to complete it completely before BSNL JTO 2016 examination. 5. Start your preparation from basic then moderate then hard. All sort of question would be asked in BSNL JTO exam. Some would be easy & some would be hard, Some would be theoretical & some would be numerical. 6. Solve previous years BSNL JTO papers precisely. BSNL JTO question may get repeated and by solving previous years papers you are being familiarize with questions asked in BSNL JTO exam. 7. Regularly practice question of the same level from reference books. These related questions will prepare you as per BSNL JTO question paper level. So solving related questions will surely increase your marks in BSNL JTO exam. 8. Join some good online/offline mock tests and prepare for them precisely. These online/offline BSNL JTO mock tests will prepare you to be familiarize with exam like environment and will also help you to improve your performance in exam. 9. Make a proper time table as per your daily routine and stick to that. As you have less time to prepare, So you need a proper plan to complete your whole BSNL JTO 2016 syllabus within time limit of 6 months. 10. Always keep a place for revision in your time table. Revision is really-really important because you can’t remember all the things you have studied in last 6 months.